We are approaching a monumental moment when the bursting of the U.S. treasury bond market bubble will have finally arrived. The implications for this could fill tomes on a bookshelf, and I spent the entire 2013 Outlook and 2013 Second Half Outlook discussing some of the fall out that will occur when this bubble deflates. 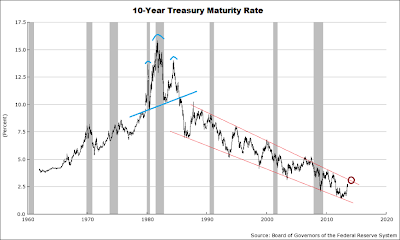 The 10 year treasury, the fulcrum that all rates are based on around the world, has been in a steady declining channel for over thirty years (secular bull market). Should this channel be broken, it will mark a monumental technical change in the charts that will symbolize the beginning of a new era. I will obviously continue to watch and update the following chart on a regular basis as we move forward. Just another correction in my opinion. I think the 10 year will eventually go to 1% and below before its over. Small speculators are extremly bearish right now. They're usually wrong. We might hit that upper channel and then see a major short squeeze. The Federal Reserve will sacrifce the USD to keep yields low. When the treasury bubble does pop, it will coincide with the death of the USD and possibly the death of all fiat money. Agree that a rally is due. Daily sentiment index moved below 10% bulls this week.